As we heard in late December, Yahoo was planning to “sunset” a number of its products, including Delicious, AltaVista, MyBlogLog, Yahoo! Bookmarks, Yahoo! Picks, and AlltheWeb. While we all assumed sunsetting meant shutting the product down, Yahoo said it was actually looking to find a better home for Delicious. But Yahoo recently notified users that it would be shutting down MyBlogLog in May. And it appears that in the case of AlltheWeb, sunsetting is also leading to the search engine’s demise. As stated on AllTheWeb’s front page: Yahoo! 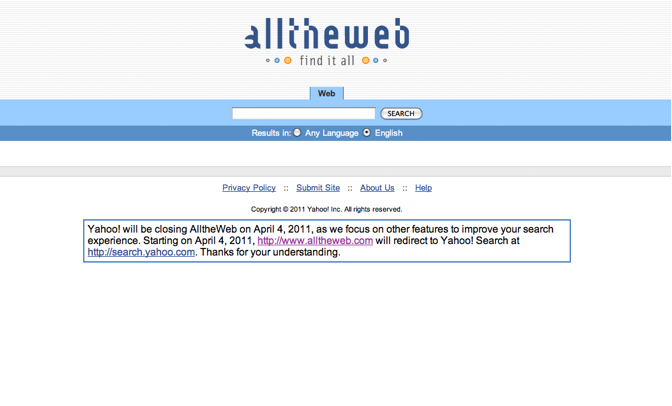 will be closing AlltheWeb on April 4, 2011, as we focus on other features to improve your search experience. Starting on April 4, 2011, http://www.alltheweb.com will redirect to Yahoo! Search at http://search.yahoo.com. Thanks for your understanding. Unlike Delicious, AlltheWeb’s fate isn’t really much of a surprise. Yahoo acquired the search engine In March 2004 via the Overture deal with the hope of building up its own search platform. Overture actually purchased both AlltheWeb and AltaVista in 2003. Yahoo gained these search properties when it acquired Overture in 2004. Of course, with the huge success and rise of Google, AlltheWeb didn’t stand a chance. And thanks to both Google and now Microsoft Bing’s dominance, Yahoo’s own search portal isn’t doing that great, forcing Yahoo to outsource its search to Bing. By way of history, AlltheWeb was one of the early search engines on the scene but never managed to pick up lasting traction. According to its Wikipedia page, the search engine was indexing around 3.3 billion pages before it was acquired by Yahoo in 2004. Another Yahoo acquisition bites the dust. Who’s next?